Henry Poettcker: Bible college president and church leader; born 27 March 1925 in Rudnerweide, South Russia, to Johann (19 December 1882 – 06 May 1940) and Margaretha (Voth) Poettcker (20 June 1891 - 26 November 1964). He was the eighth of nine children in the family. He was a few months old when he and his family moved to Canada. On 4 July 1946, he married Aganetha (Agnes) Baergen in Tofield, Alberta, Canada. The couple had three children, all of whom survived childhood. 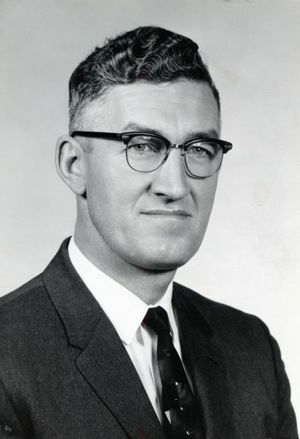 Henry taught and served as president of two Mennonite Bible colleges, one in the United States and one in Canada, and also as president of the General Conference Mennonite Church (now Mennonite Church Canada). He died in Winnipeg on 24 May 2015 after suffering a stroke. When Henry was still just a baby, he and his family moved from the Soviet Union to Canada, settling first in St. Elizabeth, Manitoba, before moving west to a farm near Pincher Creek, Alberta. He began his education at the Springridge Public School, where he continued for the next few years. He had to leave school to help on the farm after his father died, but he was later able to continue his studies and to complete high school. He made a commitment to Christianity at the age of fifteen. During the winter of 1942 to 1943, Poettcker attended classes at the Menno Bible Institute in Didsbury, Alberta. While he was there, he met Aganetha (Agnes) Baergen, (Feb 19, 1926 - Feb 07, 2014), daughter of Gerhard (1877-1954) and Margaretha (Baerg) Baergen (1882-1912) and the two married on 4 July 1946 in Tofield, Alberta. They eventually had a daughter and two sons. For the first eight years after his marriage to Agnes, Henry continued with his education at schools in Alberta, Kansas, Illinois, and New Jersey. After he obtained a PhD from Princeton University in the United States, Poettcker obtained a teaching position in 1954 at the Canadian Mennonite Bible College (now part of the Canadian Mennonite University) in Winnipeg. Five years later, he became president of the college, a position that he held for the next 19 years. Meanwhile, Poettcker was deeply involved in the church, serving as president of the General Conference Mennonite Church from 1962 to 1968. He also wrote Sunday school materials for adults in German and English, as well as submitting articles to various Mennonite periodicals and other publications. During his sabbaticals, he traveled to South America, the Middle East, and other areas of the world. In 1978, Henry left Canada to serve as the president and professor of New Testament at the Mennonite Biblical Seminary (now the Anabaptist Mennonite Biblical Seminary) in Elkhart, Indiana. He continued to work there until his retirement in 1990, when he was named President Emeritus. The Poettckers then moved back to Winnipeg, where Henry cared for Agnes after she suffered a severe stroke. She died in February 2014. Henry spent the last part of his life at the Pembina Place Personal Care Home in Winnipeg, where he died following a stroke on 24 May 2015. Henry Poettcker was a dedicated scholar and instructor whose work helped to shape church leadership in Canada and the United States. Through his academic achievements, church work, and personal life, he showed the high value that he placed on his heritage and his faith, giving an example for others to follow. Epp, Aaron and Deborah Froese. "Former Mennonite leader, team builder, Henry Poettcker dies at age 90." Web. 28 February 2017. http://news.mennonitechurch.ca/former-mennonite-leader-team-builder-henry-poettcker-dies-age-90. Poettcker, Henry. A President’s Journey: The Memoirs of Henry Poettcker. Winnipeg: CMU Press, 2009. Winnipeg Free Press Passages. "Aganetha (Agnes) Poettcker (Baergen)." Web. 28 February 2017. http://passages.winnipegfreepress.com/passage-details/id-210628/POETTCKER_AGANETHA. Winnipeg Free Press Passages. "Dr. Henry Poettcker." Web. 28 February 2017. http://passages.winnipegfreepress.com/passage-details/id-225288/POETTCKER_HENRY. Huebert, Susan. "Poettcker, Henry (1925-2015)." Global Anabaptist Mennonite Encyclopedia Online. March 2017. Web. 26 Apr 2019. http://gameo.org/index.php?title=Poettcker,_Henry_(1925-2015)&oldid=155447. Huebert, Susan. (March 2017). Poettcker, Henry (1925-2015). Global Anabaptist Mennonite Encyclopedia Online. Retrieved 26 April 2019, from http://gameo.org/index.php?title=Poettcker,_Henry_(1925-2015)&oldid=155447. This page was last modified on 24 October 2017, at 14:32.